I’ve always been fascinated by abandoned places. I enjoy walking through the space and imagining who has been there before me and how it might have looked before it was considered abandoned. I really love to bring something beautiful and creative back to an otherwise unsightly location. We are all way too quick to consider something ugly or not useful anymore because we personally no longer see a need for it. My photographer, Lauren, and I both love abandoned spaces and have tried to incorporate as many spaces as we can into our photo shoots. There is something redeeming about giving a space purpose again and using it as the back drop for something so creative and fun as Fashion. This also holds true with thrifting. Just because we no longer see a need for a particular piece of clothing in our wardrobe doesn’t mean it can’t bring joy to someone else’s life! One man’s trash is another man’s treasure! Thrifting not only gives these pieces of clothing new life and allows them to be useful again, but it helps our planet by re-using what we already have instead of always buying the next new thing. 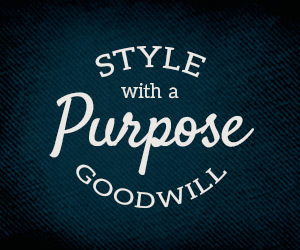 Give it a try and allow something you thrifted to be new to you! I always struggle with the concept of looking too “sweet” with what I wear. I want my style to reflect my personality, and we all know I’m tough as nails. Haha! I loved this dress right when I saw it, but knew I wanted to wear it in a way that was funky and fun to take the edge off of its baby doll style. I have been absolutely in love with orange lately, so I stuck with the theme of the dress and worked with a semi-monochromatic vibe. While toying around with outfit ideas, I remembered having these socks from years ago and thought it was just the “bad girl” vibe the dress needed to make it more sassy. I then over-accessorized, turned my attitude to level 10, and a look I could be proud of (but maybe not wear home to momma 😉 ) was born!